19th March was Father’s Day here in Spain. 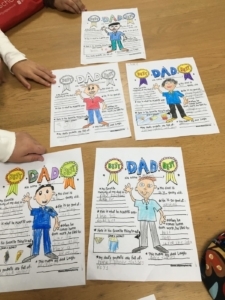 A special occasion not only for ‘him’, but also for the younger members of the family who so eagerly and excitedly make a present for their fathers making use of their unlimited imagination. Among the different things they enjoy doing with their Dads include going for a walk to the park or travelling. Laura pointed out that she gets to enjoy her Dad’s hobby, which is singing, every time they get in the car! 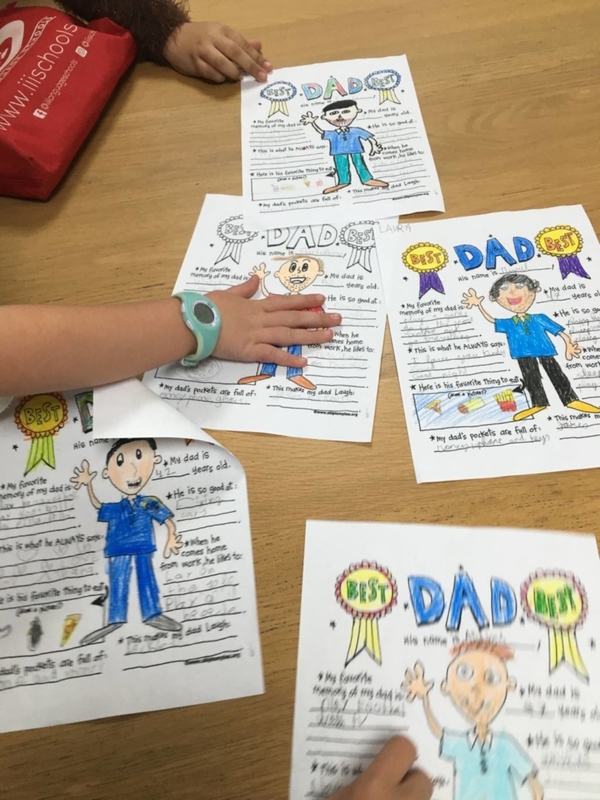 They have also included things their Dads are good at: some of them are great cooks, others are great handymen but the majority just tell bad jokes. 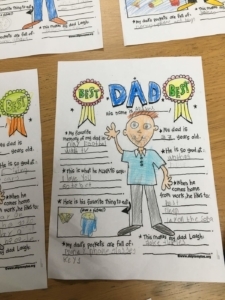 We also find out about their favourite food, although we sincerely think students have made up their own list – ice-creams, pizzas, burgers among others. The most curious thing was when they looked inside their Dad’s pockets. Yes, because we also wrote about that in our project. “Bits and pieces of paper!”, “coins!”, “keys!”, they shouted. And all of a sudden we heard, “his glasses, that’s why they are always bent!” We just couldn’t help laughing..
An appropriate ending to the project was a drawing of the Star of the day. We had the chance to see bushy moustaches, different hair styles and different types of beards. As one child confessed, “when he kisses me when he has short beard it hurts my hace, but when it’s longer it doesn’t hurt that much”. They close their notebooks and pencil cases and as our little students leave the classroom, they are full of excitement and ready to give their fathers the work they have produced. Well done children, your hard work has paid off as Daddy will be really proud of you.